Yesterday Vince Wilfork was given an award for community service. He received the Ron Burton Community Service Award at the Patriots Kickoff Gala. Many of the popular sports figures in the Boston area have foundations that they use to advance research for certain illnesses or to help the community in other areas like poverty and mentorship. Vince Wilfork’s foundation does a lot of work for diabetes research because his father died because of it. 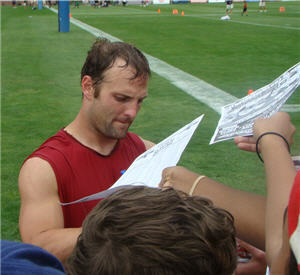 When I saw the report on the news it didn’t surprise me since he seemed pretty down to earth a few weeks ago at Patriots training camp where he and Wes Welker were kind enough to sign autographs for the many fans. The autograph signing was mainly for younger fans which can obviously make their day if not their year. Tom Brady was not able to sign autographs that day(he seemed to still be nursing some sort of hand injury). Though this was disappointing we were there last year when he went out of his way to sign autographs for his special needs fans. Whether they want to or not our sports players are role models. 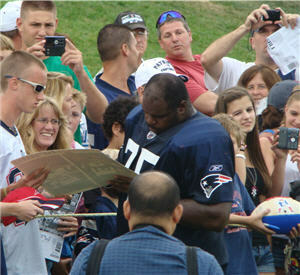 Wilfork and Welker are fan favorites not just because of what they do on the field. Wes Welker will no doubt be respected for his work ethic and the discipline it has taken to come back from a pretty serious injury.